The course summary box next to the “hero image” (image at the top of your course), displays information about your course to users who are not enrolled and at the top of the course once users enroll. 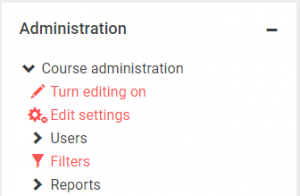 To add a course summary make sure that you are in the course and you have turned editing on then go into the Administration block and select Edit Settings. You can then type your text directly into the course summary box and save and display. We recommend no formatting and a word limit of 150-200 words. You may also want to add a hero image to your course at the same time.